I hope you’re excited, because today I am about to share with you one of my absolute favorite recipes of. all. time. 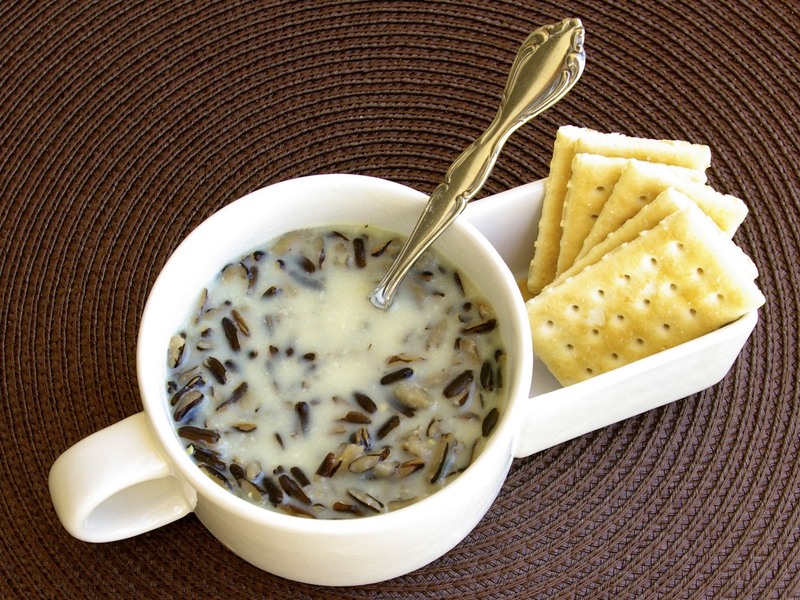 It is my Mom’s wild rice soup and, in my opinion, it beats all other wild rice soups ever. Period. I have so many wonderful memories of growing up as a child and smelling that wonderful aroma of cooking wild rice. Whenever I breathed in that delicious scent, I KNEW we were eating wild rice soup that night, and could not wait for dinner. My mom would always serve this soup with some warm bread to dip in the creamy broth, which put the meal over the top. I’m telling you, best. soup. ever. Mom’s original recipe uses carnation evaporated milk (NOT sweetened condensed milk) which yields an incredibly creamy broth. I recently experimented with some whole milk that I had left over from baking cupcakes and was equally pleased with the rich results. 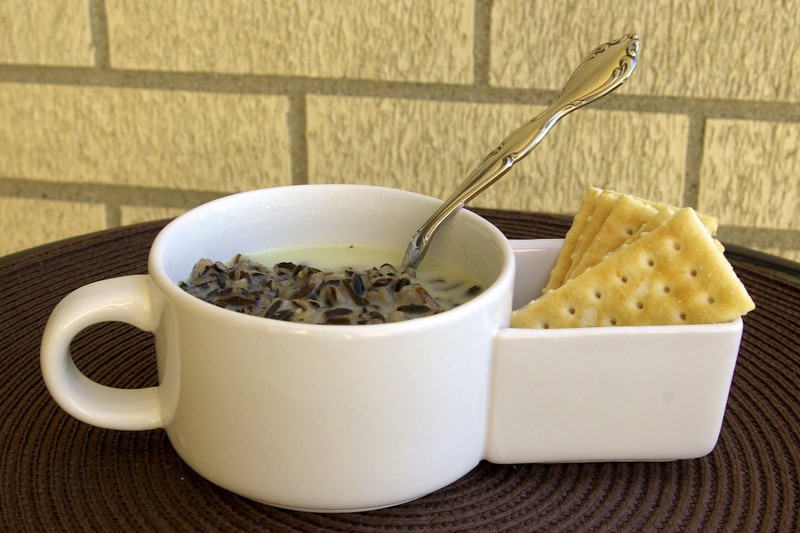 Further, this recipe calls for about 2 cups of cooked wild rice. This is of course easy to do, but if you’re crunched on time, I have a solution. Target’s Anchor Farms brand makes a bag of precooked wild rice, which yields just about 2 cups and is a perfect substitute for making your own. So whether you have an hour or 15 minutes, this soup is ready for you to devour! Serve it alongside a hunk of beer bread (or any other favorite bread) and enjoy! P.S. Aren’t these dishes cute? I got them from my aunt for Christmas one year and I just love them! You can easily make this recipe vegetarian by swapping the chicken broth for vegetable broth. You may also include cooked chicken, shredded carrot or slivered almonds to this soup, they make wonderful additions! In a medium sauce pan (at least 2 quarts) melt butter. Add onion and sauté until tender. 1-2 minutes. Whisk in flour and cook a minute or two, to cook out raw flour taste. Slowly whisk in chicken stock, being sure to avoid any lumps in the flour. Allow broth to thicken slightly. Add in cooked wild rice and let simmer about 5 minutes. Stir in milk, salt and pepper, to taste. Heat until JUST about to boil, and serve with your favorite bread for dunking. Recipe from my mom, thanks mom!